Zilvia.net Forums | Nissan 240SX (Silvia) and Z (Fairlady) Car Forum - View Single Post - TX FS: OEM S14/S13, KA/SR, Tomei, Blitz, Holset, Z32 Maf, Misc. Parts Must Go!!! Thread: TX FS: OEM S14/S13, KA/SR, Tomei, Blitz, Holset, Z32 Maf, Misc. Parts Must Go!!! FS: OEM S14/S13, KA/SR, Tomei, Blitz, Holset, Z32 Maf, Misc. Parts Must Go!!! Contact Info: PM. Email @ [email protected]. Or text me @ three 5 two 3 one 8 three 0 two nine. No calls please as Im usually busy at work. Payment Methods: Paypal payment ONLY!!!! for any buyer not local. Local buyers CASH IN HAND!!! All prices are OBO. Serious offers will be considered. Don't like my pricing then MAKE AN OFFER don't be a GIRL and cry about it in my thread!!! Package deals can be made and will be offered at a DISCOUNTED price!!! Prices DO NOT include shipping costs!!! Shipping: All items will be shipped at buyers expense via usps priority with a tracking number. I am not willing to ship the larger items at this time as its just to much of a headache. Unless you wanna pay for my time then we can talk. Seller Policy: I reserve the right to sell to any buyer I choose. Of course I will be as fair as possible and not sell out from under someone else. FIRST COME FIRST SERVED!!! There are no RETURNS. All parts have been inspected by me and were in perfect working order when removed, unless otherwise noted under the part listing. 1. Holset HX35W Exhaust Housing w/ Dump: Item is in perfect working condition. Has been media blasted so it is nice and clean. Does not include a wastegate actuator. 2. 2X S14 SR Oil Filter Adaptors: Both items are in perfect working condition. Both have been media blasted and are nice and clean. 3. S13 Upper Coolant Inlet: No longer available. 4. S14 SR Power Steering Adjustment Bracket w/ Adjuster Screw: Item is in perfect working condition. Adjustment screw is not stripped or bent like most out there. 5. SR/KA OEM Thermostat: Item is in perfect working condition. Was installed for a very short period of time on my car before I switched to a Nismo Low Temp Thermo. 7. Tomei SR Rocker Arm Stoppers: Asking: SOLD!!! 8. OEM SR20 Oil Pan: Item is in good condition. No large dents or cracks what so ever. When I installed it on my rebuilt motor I puttied it to verify proper clearance between pan and pickup screen and all is well. 9. Z32 MAFS: Asking: SOLD!!! 10. OEM SR Boost Solonoid w/ Bracket: This item is in good condtion. This came with my clip I purchased many years ago. Never ran it so I can't verify working or not but my clip was very clean and didn't have any running issues at all when I installed it. Had 60K km's on clip when I purchased it. This came off a Zenki sr for reference as I have heard the plugs are different between Kouki/Zenki. 11. OEM S14/S15 SR Oil Pump/Front Cover: Item is in good working condition. Held perfect oil pressure on my engine before I tore it down for forged internals and purchased a new front cover with pump. 12. OEM S14/S15 Manifold Vacuum Line: Item is in perfect working condition and was recently media blasted. This mounts to the bottom of an S14/S15 OEM intake manifold. 13. S14 Kouki SE Gauge Cluster: Asking: SOLD!! 1. OEM S13 SR Camshafts: These are in perfect condition and were just recently micro polished. 2. 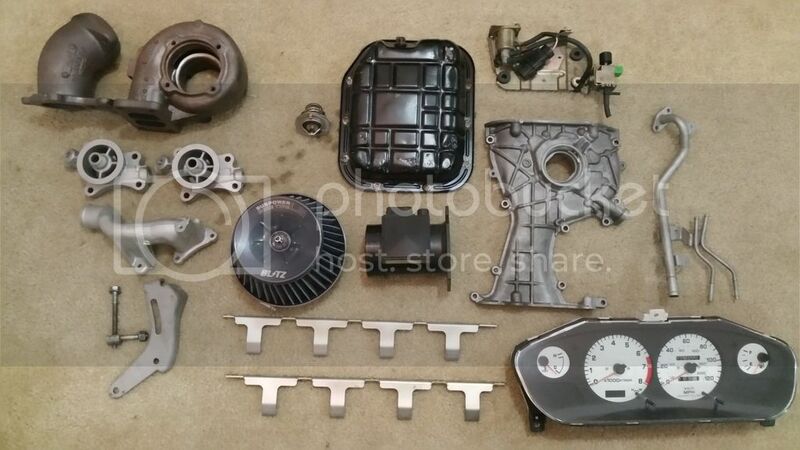 S14 Clutch Hardline & Dampening Loop w/ DIF SS Line: Items are in perfect working condition. I converted to a Chase Bays complete SS line so no need for this anymore. This is the complete lines needed to run from the clutch master cylinder to the slave cylinder. Line was not bent upon removal and none of the fittings have been stripped. 3. S14 Brake Hardlines: All lines are in perfect working condition with no stripped fittings. I am running the full Chase Bays SS brake line setup so no need for these anymore. All lines were removed while the engine was out so they are not bent out of shape at all. Should install in any S14 chassis like factory. These run from the brake master to the oem lines that mount directly to the calipers in the front and to the damping box for the rears. These lines were bent to be used with Z32 Master Cylinder. 4. 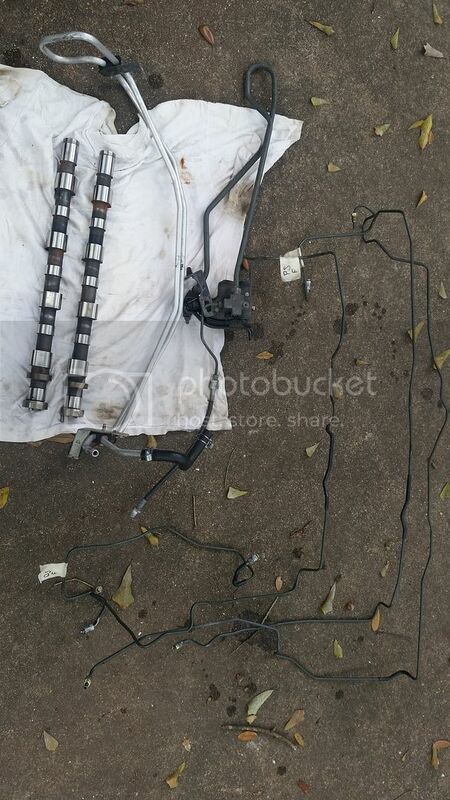 S14 Power Steering Cooling Loop: Item is in perfect working condition and includes mounting brackets. I am running a Chase Bays PS Reservoir Relocation Kit so no need for this anymore. It is very clean and free of all road grime. Once again all items are OBO! More detailed pictures can be had of any items per request, just shoot me a pm or text and Ill send them over. Last edited by speedfiend; 01-01-2017 at 09:20 AM..